Berlin is kind of lucky to be situated more or less right in the middle of one of Germany’s largest Asparagus areas. The Brandenburg soil is perfect for growing the healthy and tasty, yet a bit strange vegetable. 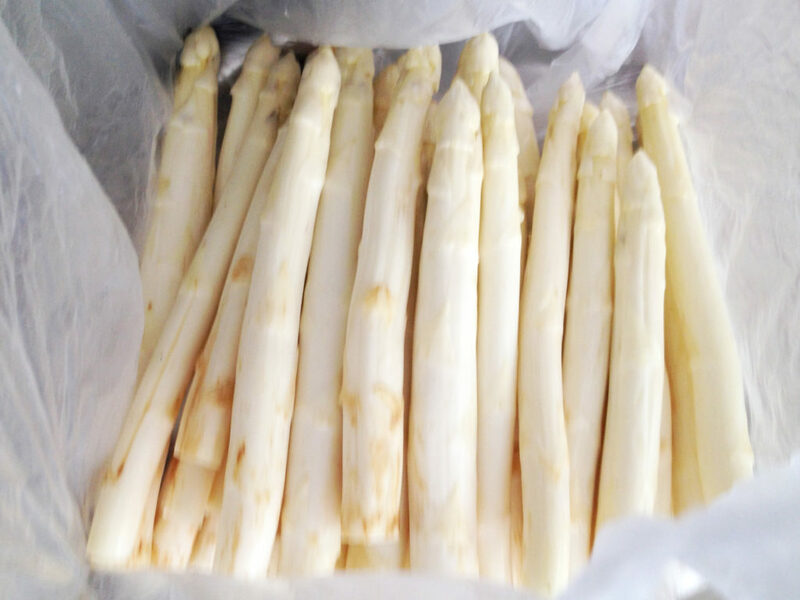 So it’s not really a surprise that during Asparagus’ high season you will find Spargel probably in every supermarket, on every farmers’ market – and in many, if not all Berlin restaurants. Growing up in an Asparagus area myself it was first a bit difficult for me to understand that not everybody is used to eating, let alone preparing Spargel. 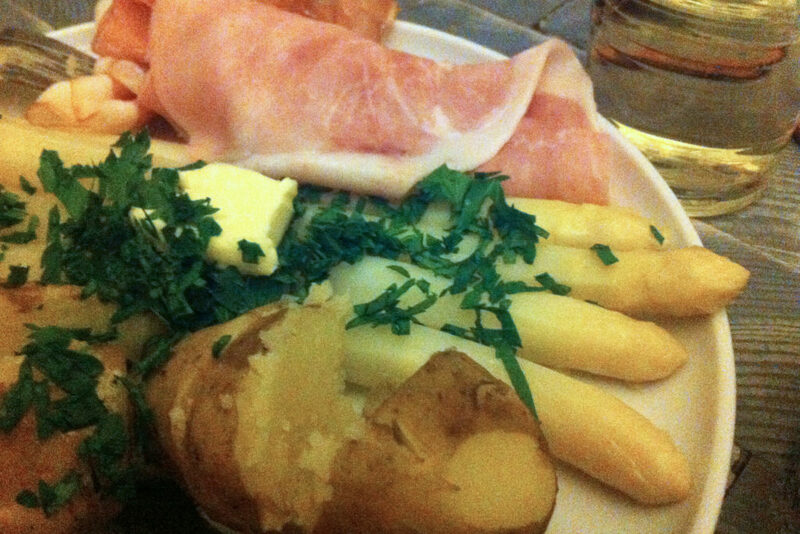 So in the past couple years we are at least having two or three Asparagus dinners – preparing and eating it ‘the traditional way’ / the German way’. On this page I would like to share some of the details I know about Asparagus – and how to actually prepare Asparagus ‘the German way’. The Asparagus Season – When do you eat Asparagus? There is no official beginning of the Asparagus season. All it takes to have the first white sticks in the shelves is a couple of warm days in a row. Since in the past years farmers have been experimenting with covering the fields with black foil, the season usually starts at the end of April – sometimes a bit earlier, sometimes a bit later. First of all, after midsummer the days are getting shorter – and since Asparagus needs the warmth of the sun light the quality probably won’t get much better. Second, after eating Asparagus for about eight weeks in a row, hardly anybody can stand the idea of eating even more of it. Of course there are some die hard fan can would and could eat the white sticks all through the year – but I suppose that at some point demand is declining – and then that was that. Last but not least: the official reason for the Asparagus season ending on June 24th is that the plants have to regenerate. During the high season they don’t see much sun light – or actually no sun light at all. But if you are planning to grow Asparagus also in the following year you better let the plants see some sun light, so they can do their Chlorophyl thing, as almost every plant is supposed to. How do you prepare an Asparagus meal? The classic Asparagus recipe. Preparing Spargel the classical way does not really take much effort. I wonder if the ‘Asparagus recipe’ I am following is actually a recipe – or just a construction manual for a delicious meal. This might sound a bit pretentious – but cooking Asparagus is all about boiling water. So from my point of view there are not really many ‘serious’ cooking skills involved. Proof of concept: even I can do it. So it can’t be that difficult. First you obviously need to find some fresh Asparagus. For a main course you would want to buy 500gr per person – following the old rule “Pro Mund ein Pfund” which would mean One Pound for each Mouth. This might sound a lot, but it is basically the perfect amount. You should look for a vegetable stand where you can actually get your hand on the white sticks – rubbing them gentle against each other they should make a sqeaking sound – then it’s fresh. Next you’ll have to peel the Spargel – which can be a bit difficult, if you don’t have the right tool. During the high season there should be lot’s of these tools available – just ask for a “Spargelschäler” or ask anybody around for a tool to get the peel off – people will know what you are looking for. Ah – and also cut the “feet” off – that part can be a bit woody. All that is left to do is boil the Asparagus. I usually put salt in the water, as if I was boiling pasta or potatoes. Then add a little bit of sugar – and a spoon of butter. At the same time you can boil the potatoes – both vegetables need about the same amount of time – but do boild them separately in two different pots. The Asparagus is ready to be eaten when it’s slightly elastic. If you pick up one of the sticks with a fork it should bend like a rainbow. Traditionally you would then also serve slices of cooked ham and slices of smoked ham. Put a bowl of Parsley and a plate with butter on the table so everybody can add those ingredients as they like. Oh – and white wine does go well with the dish. That’s about it – Bon Apetit! PS: of course there are different Asparagus recipes out there – but as I said before: I’m not much of a cook – so this is ‘just’ one way of doing it – but to me this is basically ‘the’ way of preparing a Spargel meal.